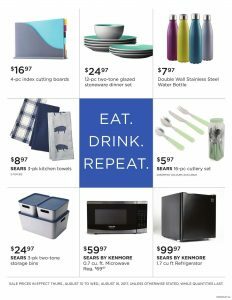 Sears Flyer August 10 2017 – Eat Drink Repeat! Hello everyone, we welcome you with today’s brand new Sears Flyer August 10 2017. In it, you can find many ideas and cool items to colour your home. You can also find many electronics for your everyday needs such as microwave, mini refrigerator and so on. There are also many cool items on Essential for school section for your kids and young adults. 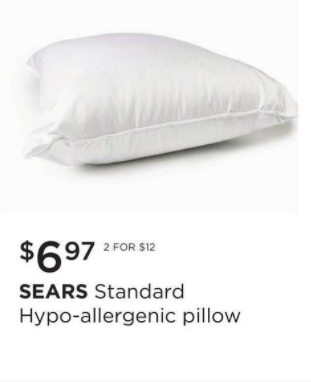 Our bedrooms also can change its colour with today’s Sears Flyer August 10 2017 with its brilliant options on twin sheets and Hypo-allergenic pillows. All of these items on big discounts on today’s flyer, so be quick and claim those deals while you can! Now, let’s see today’s Sears Flyer August 10 2017 can offer! Today’s flyer offers you many good deals on Varsity Blues section and in it, you can find towels, bed sheets, twin sheets, pillows and so on. These items are must haves for your room, so if you are looking for something like that, than today’s Sears Flyer August 10 2017 is just for you! 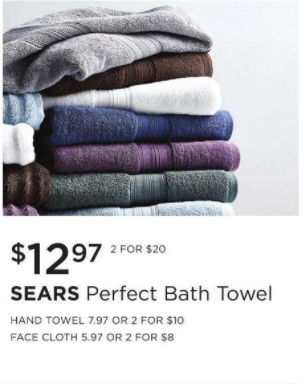 Today’s Sears Flyer August 10 2017 also have many good deals on every day kitchen items such as 16-pc cutlery set, kitchen towels, storage bins and so on. In today’s flyer, everyone can find their needs, so do not forget to check out this flyer right now! These are the best deals on today’s Sears Flyer August 10 2017 but you can always find more by just clicking HERE. Also, please do not forget to subscribe our news teller for daily updates and biggest deals on Sears and many other retailers on Canada. See you on next deals! Sears Flyer Home Sale 6 Aug 2017 gives you a short and clear flyer! In this week, find perfect ideas for the fall season. Modern Glamour theme is on! Explore the new color of your bedroom for this season with Sears Flyer this week! 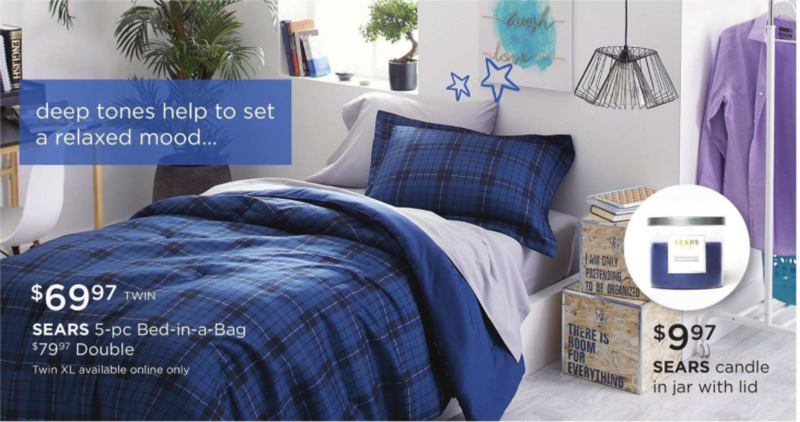 Importantly, you will see amazing 7 – pc Bed – in – a – Bag Comforter Set awaits your attention. on the top of the first page of the Sears flyer you can find this beautiful selection for your bedroom. As you can approve, changing bed sheets means a lot. It even can change all aura of your bedroom. These elegant options are really soft and it will make you feel really comfortable. For the style of your home, Sears Flyer this week offers you classy options. Under the comforter set, you can see 3 amazing ideas that will make your home look really modern and beautiful. 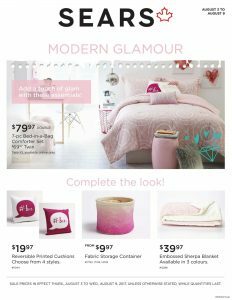 For some cute cushion sets, Sears Weekly Flyer must be a place you must check! Make your living room really beautiful with these amazing cushions. Also, these cushions are comfortable. So, make sure this purchases will be really beneficial! Moreover, you can need some extra space to store your goods in your home safely. In Sears Flyer this week, first page contains really classy Fabric Storage Container. These containers are not only classy but also useful. It will make your rooms look really tidy and also beautiful. Sears Flyer this week offers you an amazing Fabric Storage Container. Obviously, it will be a big benefit for you! To finish up this option with my ideas, purchasing these containers will be really smart idea. Next, rain season comes really fast. For your daily comfort, you can find out Embossed Sherpa Blanket in Sears Flyer this week. Under the first page of the flyer, you can see them. You can have them in three colour combinations. These blankets will make you feel really comfortable. Its soft textile will make you feel like you sleep on clouds! Its embossed design will make you feel really good in it. Give yourself a treat and go under it while reading a book and enjoying with your coffee. In addition, Sears Flyer this week offers you amazing kitchen and outdoor eating parts. In the second page of the Sears Weekly Flyer, find out really colorful Collapsible food containers.These collapsible food containers can make your outdoor eating times really comfortable. You will eat and go, very simple! Another option is plastic food storages in Sears Flyer this week. Keeping your food in the plastic bag is not only ugly, but also unhealthy. You must get rid of these bags because they are not hygienic! You can also save a lot of space because of its shapes. In Sears Flyer this week, great selections for your kitchen storage awaits your interests. Surely, these are really smart way to keep your food from insects and keep them really classy. Furthermore, keeping your water from plastic bottles are definitely unhealthy! You must change your bottles to keep your drinking water fresh! In Sears Flyer this week, find out double wall Stainless Steel Water Bottle! In the second page of the flyer, you will find these colourful bottles which will make you look cool. You can store your waters in your fridge with these water bottles! Moreover, change your cooking pots and pans with really useful selections in Sears Flyer Home Sale 6 Aug 2017 week. Start a new season with new kitchenware from Sears store! Perfect deals await your interest this week. First of all, skillets would be really good idea for your new kitchen! As you know, you should change your kitchenware for your health because it can be dangerous if overused! So, it is a great chance for you to change all your skillets and pots. Secondly, if you look for great cookers, Dutch Ovens are on your service! If you look for high – quality cooking options, dutch ovens await you in Sears Flyer. It is the exact time for replace your kitchenware. Sears Flyer this week gives you an amazing selection, make sure that you will get benefits from these offers! Check out the best deals and start enjoying with amazing ideas. Sears Flyer this week is full of benefits for everyone. It is the best time to replace your old stuff in home! 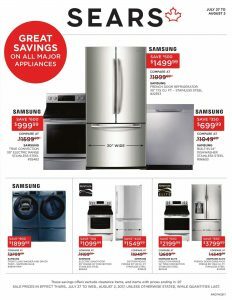 Sears Flyer Home Sale 30 Aug 2017 contains great savings on all major appliances. Now get ready for maximum savings. Samsung and Kenmore Elite products on sale. In store, you can find more kitchen appliances varieties for sure. If you want you can buy online from the official website or visit a store today! These deals are available until 9 Aug. So, now is right time to change your appliances. If you are big family, Samsung French door fridge is a good choice. Cause this fride has two door and 30 inch wide. Nice touch by Samsung and nice deal by Sears. Now you wont pay nothing for extra. You can put whatever you want in this fridge. Last year my niece bought 20 inch wide fridge and it was quite enough. But this Samsung fridge on sale for good price. $500 discounted and its unique deal. Some products are useful but looks not very good but this Samsung fridge looks stylish also. Now do not miss this one. We are using washers only for wash our clothes but this Samsung front load washer provides an extraordinary experience. Front load washer and dryer looks fantastic. Also like Samsung fridge, this product on sale. You can save $900! Unbelievable discount by Sears fyler. Also you can find Kenmore and more Samsung products in this Sears Flyer Home Sale 30 Aug 2017. Click here and see more . Sears Days featuring quite lower prices , amazing deals and special product selections have begun ! Many types of selections that you always need in your live such as apparel , shoes , accessories , underwear , small kitchen appliances , sheet sets , cookware sets , furnitures , mowers and many more have been published by Sears Flyer June 27 2017. Moreover , they’ve lowered prices of these selected products. You will be satisfied their products when you buy it. They always bring you the best cause you always deserve the best ! Lowest prices of the season ! When I check it out , I have came across lost of special opportunities on nearly every pages of this flyer. Now , I want to give you some information and details about this. If you need something for the summer , solution is this flyer. You will reach various good looking , fashionable and great quality selections when you browse it. Every pages offer you different offers to reduce to cost of shopping. Let’s start what you have on this flyer. Especially , main page of this will draw your attention. All products have been selected by Sears for you. These selections look good and these are on discount now. Moreover , you have a good chance to pay less ! When you buy a mix & match Sears label women’s , men’s & kid’s fashions or footwear , you will get one FREE ! Page 2 is full of fashionable and stylish selections ! Trendy wonderful dresses and accessories are waiting for you to be discovered here ! Also , you will come across up to 70% savings for selected products when you browse this page. Particulary , you should focus on luggage to benefit this deals. My favourite one is U.S polo assn dresses. It is on sale too. Catch up these special options ! Haggar tops or pants , 50% off. Levi’s pants or shorts , 50% off. Page 4 includes various types of home essentials such as cookware sets , small appliances , sheet sets , pillows and more. If you are looking for some of them and want to save more , Sears is a good address for you. They show you how to get more quality and useful products at the lowest prices every week. Awesome offers that you will save up to 75% are available on this page. Let’s check it out and get your needs at reasonable prices. All Fieldcrest luxury sheet sets , 50% off ! All Royal velvet towels & bath mats , 60% off. All Aller-ease mattress , 25% off. You can check all pages of this current Sears flyer if you want to reach more details , informations and deals. In addition , you can create your own shopping list by clicking the buttons on the right of the products on this article easily. Here you go ! Father’s Day is a special day celebrated on the third Sunday of June every year. This will be celebrated on Sunday, June 18th this year. First of all , you should think what he likes to get nice and different gift for this special day. Celebrate Dad’s Day by showing gratitude and love for your father who is a your first hero and friend ! Awesome selections of Sears Flyer June 12 2017 are fabulous gifts that will help you celebrate the great man you know your father is. Get the best gift he deserve ! On this post , I will trying to give you some advice about Father’s Day and also all pages and products have been checked by me. Best ones were selected for you. You will come across perfect solutions to get the best gift for your dad. First of all, you should personalize the gift and make it different from the gifts you have received before. Do not forget to leave a note into the gifts you receive. Let’s make his day with these good looking and creative gifts. When you browse cover page , you will see perfect product selections and great savings up to 40% ! Many types of products such as watches , sandals , jeans , small appliances , power tool , grill , lawn mower and more are available on this page. It is possible to reach many products for every budget on this flyer. Particulary , Power tools and tool storages can be a good gift for your father ! Every father loves remove the screws and insert the screw. They like to make repairs. Therefore , you should focus on these selections. Up to 30% savings are featured on this page. Don’t miss these prices. Here you go ! Some products were selected for you ! National & designer brand watch , 30% off. Every Sears top , pant & short , 40% off ! Page 2 is full of fabulous selections ! A lot of high-quality , good looking and useful selections are waiting for you to be discovered. Shoes , sandals , fragrance , shaver & groomer , tools , small appliances , grills and sport product are featured on this page. you will come across good savings up to 40% when you browse this page. I think , Fragrance can be a good gift for your father. Every fragrance are on discount up to 15% off now. Also , Every fitness equipment are on sale up to 30%. My favourite selection is Napoleon lex series propane grill for $1149.99. It is great quality and useful. Moreover,if you buy it , you will have FREE DELIVERY! If you want , you can also make installment plan for it up to 24 months. Every Breville & Cuisinart small appliances , 20% off. For more deals , products , information and details , you should check other pages. Mix & match any 2 Sears essentials women’s , Men’s or kids fashions & footwear and get the 3rd FREE ! Let’s check this flyer or visit their stores and catch up awesome opportunities.